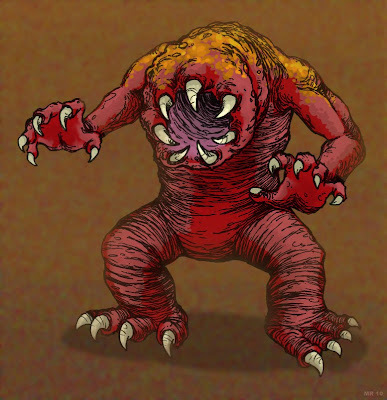 The V'sthol'Nala are a race of burrower demons. They live in a vast complex of tunnels which honeycomb the flesh-like rock of their native Hell dimension. The V'sthol'Nala do not possess sight, hearing, or olfactory senses, and instead navigate through a highly developed tactile sense. Their extremely sensitive skin can sense any vibration around them, even through soil. This sense is so sensitive that one of their race can "read" the vibration can understand when speech is directed to it.